Just for fun this morning, I want to invite you to do some liturgical math we me for a moment. For most Protestants, we have just come to the conclusion of the 40 days of Lent. Lent, you will remember, begins each year in dramatic fashion – with ashes placed on our foreheads in the sign of a cross and words spoken into our ears; words like: Repent, and believe the Gospel and Remember you are dust and to dust you shall return. Forty days. If you were to look at a calendar and count the days from Ash Wednesday (this year it fell on March 9th) through Holy Saturday (yesterday, April 23rd), you calculations may leave you scratching your head – for that brings the total number of days to 46, not 40. As many of you may know, you have to subtract out the 6 Sundays of Lent to get the number 40. Though most people still observe their Lenten disciplines on the Sundays in Lent, it is traditionally not counted as every Lord’s Day is a little Easter, a celebration of the resurrection – every Sunday, liturgically speaking, is both the first day of the week and, as Christian tradition has taught, the 8th day of the week – with is the Christian way of saying this day is a day beyond time; a day that points to the day of the new creation we have in Jesus; a day that is a foretaste of the time when every knee will bow and every tongue confess that Jesus Christ is Lord to the glory of God the Father; a feast day that anticipates the great heavenly banquet; a gathering for worship day that is a rehearsal for the great gathering of every tribe and nation and tongue that will gather one day around the throne and around the Lamb. Forty days, not counting Sundays, have brought us to this day – Easter Sunday. For many of us, we welcome Easter because it means the conclusion of our Lenten disciplines – disciplines where some of us give things up – like fasting from food, or abstinence from things we are fond of – to taking things on – like almsgiving, new devotional or prayer practices, or perhaps attempting to serve God and our neighbor in a different way. The forty days are over. Forty days that recall both Israel’s journey to freedom from Egyptian slavery and oppression, days that remind us of God’s miracles as much as they remind us of human mayhem and disobedience. On the miracle side, we remember God’s provision and grace in difficult times – over and over, and over again – when the people are lost, a cloud to guide them by day and a fiery pillar by night; when God’s people are hungry, bread from heaven; when they are bored and want variety, quail is added to the menu; when they are thirsty, water comes from a rock; when they searching for an identity, God’s gives the law that will transform them from a band of slaves into a people in covenant with their Creator. Forty days. The forty days also recall Jesus temptation in the desert by Satan; forty days that followed his baptism by John in the Jordan and that preceded his three years of ministry recorded in all four Gospels. Forty days that set the tone, tested his resolve, and proved to be only round one of Jesus battle against Satan and the forces of sin and death. The forty days are over – and here is something you may not have known. For Roman Catholics, Lent actually concludes at dusk on Maundy Thursday. Why? Because Maundy Thursday is the beginning of another set of days – three days – what is called the Easter Triduum. We are in the Easter Triduum. Triduum – it is a word from Latin that literally means “three days.” Thursday began a celebration that would last for three days. The first day begins at dusk on Thursday and goes through dusk on Friday. It is the evening of the Last Supper Jesus had with his disciples. It is a day we remember that Jesus will eat with anybody. We should have guessed that Jesus was careless and indiscriminate about whom he associates with – we have certainly been told. Luke tells us that one day the Pharisees and teachers of the law were observing how Jesus had tax collectors, sinners, and ritually “unclean” people around him all the time. They complained saying “this man welcomes sinner and eats with them.1” Hours before his last breath on earth, Jesus was still doing it. In fact, unbelievable as it may seem, Jesus went further. He didn’t just eat with sinners, he washed their feet knowing that virtually everyone around the table with him that night would abandon him before the break of dawn; knowing that some would sleep through his worst spiritual anguish, one would deny him three times, one would betray him with a kiss, and virtually everyone else would be huddled behind close doors looking out for number one at their teacher’s greatest hour of need. Knowing all of that, Jesus eats, Jesus washes, Jesus teaches, Jesus promises, and Jesus loves and commands them to do the same. Take a look at this first day of the Easter Tridiuum. Look close. Don’t forget it. What wondrous love is this – what wondrous, foot-washing love is this that causes God-in-flesh to take towel and basin in hand and kneel before people like you and like me – knowing our faults, knowing our weaknesses, knowing our betrayals, knowing our denials, and knowing our fears – but washing us in love anyway and inviting us to wash others in the same love. It is important to remember this first day of the Tridiuum – we call it Maundy Thursday – the day of the great commandment – I give you a new commandment – that you love one another. The second day of the Triduum is Good Friday. It is a day of horror, torture, humiliation, and human suffering. Jesus’ silence and refusal to defend himself against false accusations is matched ounce for ounce with verbal mocking, jeering, and ridiculing crowd whipped into a blood-thirsty frenzy. It is a day that, as Gerard reminded us this past Friday, despite our objections to the contrary, we remember that we were there when they crucified our Lord. We were there. Somehow, someway. If not physically, then in spirit – in perhaps a spirit of apathy, or a sinister and complicit spirit of collaborating silence, or in a spirit of violence and blood lust, or a spirit of indifference or “I-don’t-want-to-get-involved” detachment, or a spirit of hand-washing denial, a spirit of pretext that states “I’m only following orders”, or a spirit of hatred, envy, and outright loathing. Somehow, someway – we were there, when they crucified our Lord. Look closely at this day of the Easter triduum – the one we call Good Friday. Look closely, because there you will see hatred overcome with love, violence exposed by peace, sinners and offenders offered forgiveness, apathy challenged by engagement, denial and forgetfulness countered by remembrance and promise. There you will see the price of our rebellion, our petty jealousies, our inhumanity, our rejection of God, and our broken relationships that have affected and infected everything we touch. God-in-flesh came among us, doing nothing but bringing healing, life, hope, and purpose to all creation – and the world responded like the fallen, broken, fearful people we have become. Look closely on Good Friday – for here you will see Abu Ghraib, Guantanamo Bay, the Nazi death camps, the twin towers, the war in Afghanistan, the war in Iraq, the war in Libya, the war in Sudan, Rwanda, and Burundi; here you will see the sinister, horrific side of human rebellion when it is allowed to run amuck, to have its own way – when we allow ourselves to give in to fear, to vengeance, to violence, and to putting our personal needs and desires above all others. It is important to remember this day of the Easter Tridiuum – we call it Good Friday – the day when we hear a different word from the cross: Father, forgive them, for they do not know what they are doing. Have you experienced that day? For some of us, we may still be in that day. The day after, for some, may be a day that has stretched into months or perhaps even years. Holy Saturday is the day where we ask questions without readily available answers, a day of longing that is accompanied with grief and shock, a day of doubt and ever growing despair, a day that – it is has hope – is a hope for the day to end and for a new day to dawn. Well, church, I have Good News for you this morning. There is a day after the day after. Because, as John reminds us: Early on the first day of the week, whit it was still dark, Mary Magdalene came to the tomb and saw that the stone had been removed from the tomb … Good news church … the tomb is empty! Christ is risen. He is risen indeed. We have been taught, over the years, that Easter is the ending to the story of Jesus. And we’ve come to think of this day as the end of the season of lent. But Easter is really the beginning of our Christian year. It is the beginning of new life for Jesus. It is the new beginning for all creation: here God begins making that new heaven and new earth. In fact, the early church expected Jesus to return and finish the job about sunrise some Easter morning. Easter can be a new beginning for us: here God offers to make us new creations. And the early church baptized converts into that new creation on Easter. Easter is the beginning of God’s new covenant, with a new covenant people called and commissioned to witness to Jesus’ resurrection. On the cross, Jesus cried out “it is finished.” And we thought that was the last word on the story. But on Easter morning, God cried out “it is beginning; behold, I make all things new.” And that is the message of Easter: evil is finished; God’s love begins anew. War is ended; Christ’s peace begins. Confusion is ended; celebration is beginning. Silence is ended; eager witnessing begins. Boredom ends; Easter excitement begins. Terror ends; joy begins. Revenge and resentment are ended; forgiveness begins. We are forgiven. We begin forgiving others. Sin is ended; holy living begins. Death is ended; life, new life, Easter life, begins. New life, real life, God’s life begins at Easter, and seeks us out, and seeks to live in us. 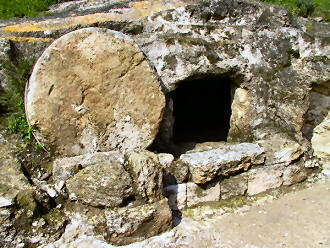 …Now Jesus did many other signs in the presence of his disciples, which are not written in this book … They are not written there, because this Easter, God wants to continue telling the Easter story in the lives of God’s Easter people – in other words – God is still writing that story in and through you and in and through me.